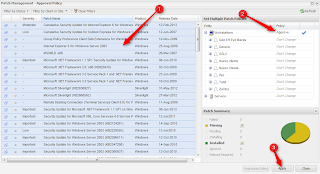 Deploying patches to multiple machines on a per machine basis is cumbersome. Scheduling reboots one machine at a time takes too long. Within GFI MAX there is no need to perform maintenance one device at a time. With keyboard shortcuts you can take three hours of work and do it in a fraction of the time! 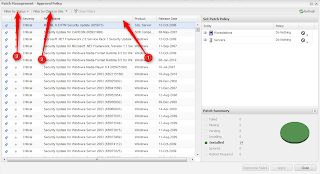 The patching system with GFI MAX allows you to approve patches across the entire MAX account. 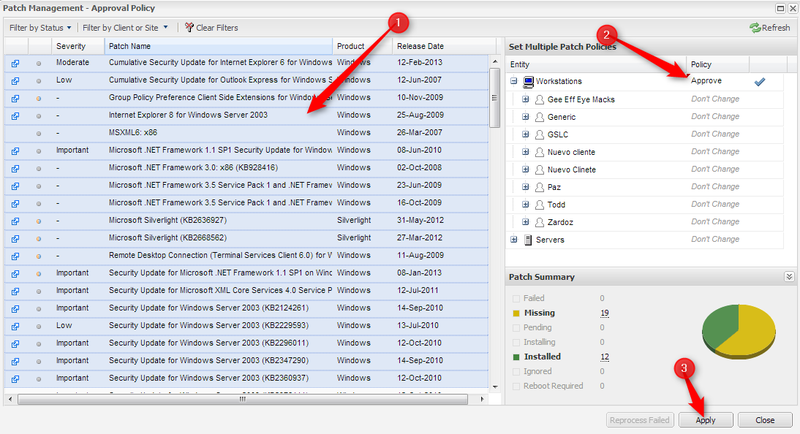 Not only can you do this, but you can select multiple patches at a time and deploy them across the entire MAX account. From the patches tab, you have access to the APPROVAL POLICY to select many clients, or all clients, and approve the patches across the account. 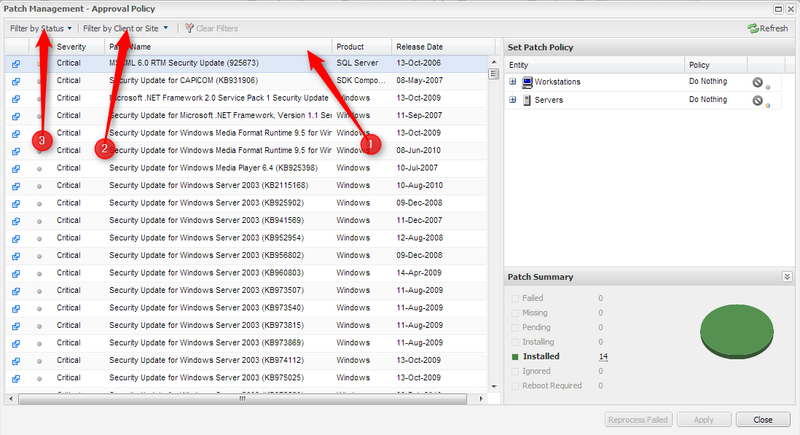 The APPROVAL POLICY shows all the patches associated with the devices where patch management is active. There are filters in this view to search for specific patches (1), filter for just clients and sites (2), and combine the filter with a status filter like what is missing (3). After adjusting the filters, single specific patches will be highlighted for approval, BUT, this is where the keyboard shortcuts come into play. If you filter for one client, then combine that with a filter for what patches are missing, you can select multiple individual patches for approval or select all the patches for approval. When highlighting multiple specific patches for approval and ignoring others, simply hold down CONTROL and left click on the patches you want to approve. The other option, after adjusting filters if you want to approve all patches in your view, highlight the top patch, then hold down SHIFT and left click the bottom patch. This will highlight all patches and now you can approve all of them on the right of this interface. Now that the patches have been approved globally, what about selecting multiple machines to install the patches manually? Not a problem! As long as the patching system is turned on for the multiple machines, simply hold down CONTROL and left click all the machines you want to deploy the patches to. This is the same for reboots. You can hold down CONTROL and left click all the machines you want to set a reboot on or all the machines you want to rerun the Daily Safety Checks.